I think I've been bitten by the bug...the clothes making bug. And not clothes for my daughter - although that is fun, she grows out of them so quickly. No, making clothes for myself. 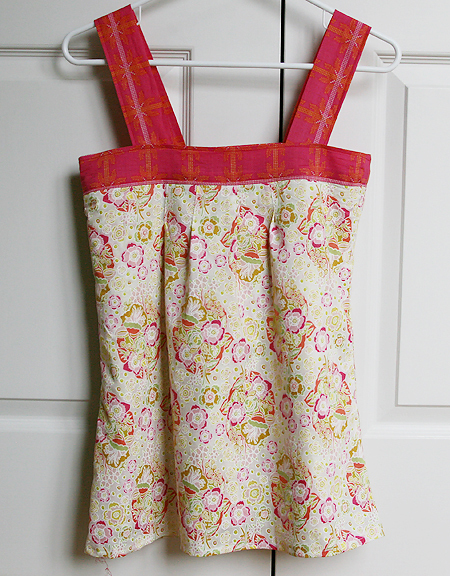 Sew Mama Sew has a great *free* tutorial for a Spring Ruffle Top by Rae from Made by Rae. Isn't it cute? I had plenty of Anna Maria Horner's Little Folks Voile left over from my baby quilt and really there isn't anything more perfect if you ask me. 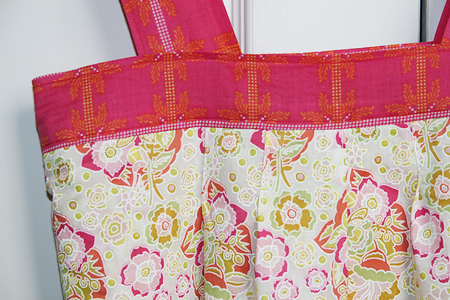 The drape is lovely and the prints are perfect for summer. And not to pick favorites, but I could probably make an entire wardrobe out of Baby Bouquet Sweet and die happy. The top portion is Four Square Berry. Not a nice day here in Chicago so my 3 year old helped take this picture inside. It's a bit blurry, but not too bad for her first try.